One year ago today, the huzband competed in his very first Ironman Triathlon in Lake Placid, New York. We still talk about it, well, because it’s a huge accomplishment. One that took time and a deep dedication! One that I am extremely proud of him for. I bugged him for months to write his thoughts down for a blog but he never obliged…till now. Out of the blue, the other day he told me he wrote up his take on Ironman Lake Placid! (HOORAY!) When I first read it, it was six pages long. (Way too long for one blog.) So I have broken it up and will post it over the next few days. I do want to take a moment to say Thank You to each and every person that has encouraged the huzband over the past few years. This was an accomplishment in the making and your support was such an intricate part of it all! From inviting him to compete in his very first triathlon (read about here), to showing up for his lonely Half Ironman (read about here), to praying for his training, his back pain and his race day! Thank You! Several months ago my friend Rusty Funk completed his first Ironman in Arizona with a killer time (12:47). I tracked him online all day and even watched him cross the finish line. It made me so proud, especially since I remember being at a hotel pool in Kigali, Rwanda after running the Kigali Peace Marathon and Rusty was there just learning how to swim. The ever awesome Michael Chitwood was giving him pointers. Hard to believe that was only May of 2012. 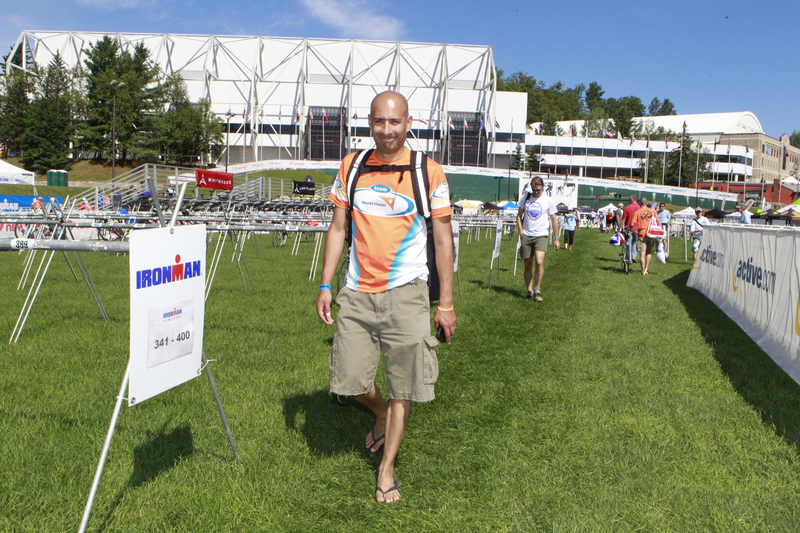 I decided it was time to write down some thoughts about Ironman (exactly a year later after completing Ironman Lake Placid) in memory of my two good friends that are changing the world and doing a phenomenal job with Team World Vision. Doing an Ironman is not only a one-day event; it requires a huge time, money and family commitment. The life of someone training for an Ironman event is one that many aren’t willing to take. For me, it was 3 years in the making. After running the 2010 NYC Marathon, I signed up for a small sprint triathlon with some friends (note, friends who were about 10 years younger than me). From there began the progression every year to do a longer distance until Lake Placid Ironman on July 28, 2013. Full distance Ironman Triathlons are difficult and can humble even the most seasoned of runners, swimmers and cyclists. It is said to just finish the distance in less than 17 hours makes you a winner regardless of your finish placement. I learned a lot about patience during these past 3 years of training. It was a long road and not an easy one to stick to. Less than 11 months out from race day, I had an unexpected surgery (you can read about it here). I went from being in the best possible shape of my life to having a hard time walking a few steps, having to stop to catch my breath and in pain from 3 different incisions on my belly. That was an intense memory but one that God used to teach me how privileged I am to be able get out, exercise and be active. The weekend of a my first race at a Half Ironman distance (70.3), I found myself waking up post-surgery, listening the doctor say the word “cancer”. Thank God testing ruled that out and it was only a matter of letting my guts heal. It took about 9 weeks to get the clearance from the doctor to do any kind of exercise. I am so grateful for how my body was able to heal but I honestly wondered in the months post-surgery if doing the full Ironman distance was really within reach. On top of that, a few months later, our family decided to listen to a whisper from God. Leaving a dream job, a new home and getting rid of majority of our possessions, we traveled across the country to make our new home in Alaska. Those 3 weeks on the road to our new home state were an adventure in and of itself. Still training while we were traveling, I think I only missed some swims but was able to keep up with majority of the bike and run training. Most days, after several hours driving (sometimes several upon several hours), I would set my trainer up in the hotel room or hit the road to run in a completely unknown terrain. I have some awesome memories of places I saw while driving the Alaska – Canada highway. The race itself is not only a matter of showing up and trying to beat the 17-hour cut off, there is so much strategy and nutrition that goes into it. The day before my race, the unexpected happened. I was bending down to help my little girl get dressed so we could go check my bike in when my back snapped. I have 2 bulging disks from a car accident that occurred when I was 23 years old. When they get aggravated (like they did that day) it normally takes 3-4 days for the sharp back pain to begin to dissipate. Here I was, the day before my Ironman, realizing I had less than 20 hours to the longest race of my life; 20 hours for my back to heal. I was so frustrated, so upset, so heartbroken. I don’t know if words can truly express how heavy my heart was that day. Once gain, I was facing the possibility that this race might not happen for me. Immediately we asked people to pray. I cannot tell you how much people’s prayers helped that night. I woke up feeling better. My back was still in pain but at least I could walk with not too much discomfort. I was very concerned about the last leg of the race, the running. I guess I should have told you from the beginning the distances you do in an Ironman: you start with the swim leg. It is 2.4 miles with hundreds of people fighting for space in the water at the same time. My swim went well though being my weakest discipline of all. I got punched and kicked in the face several times; I as well punched and kicked many people. I remember hitting a lady so hard in the face that I had to stop and try to apologize only to realize half way through the sentence off “I am so so….” that someone was on top of me and I was back under water, drinking it in. Coming out of the water my back hurt so badly. T1, transition one from the swim to the bike leg, took over 20 minutes for me. (Usually people take 5-8 minutes, at the most.) You have to run about ¼ of a mile from the lake to the tent to get changed. Most people competing were jogging or running past me. I was fighting to take one step at a time. For the quarter-mile from the lake to the transition tent, I wondered if I was going to be able to take the next step. I had some rock star volunteers that morning inside the transition tent helping me get undressed. I cannot say how grateful I was for these two guys that were on their knees helping me get my swim gear off and my cycling gear on, encouraging me to go on one pedal at a time. My swim took about 1 hour and 18 minutes, and the transition (T1) took me about 22 minutes. I decided right there, as these two guys were helping me get up out of the chair, that I was going to give everything needed to try to finish this thing until my legs would literally stop. So in that moment I changed my strategy. I changed the settings of my GPS watch from time to heart rate. I decided I was going to gauge my effort with my heart rate and just forget about time. I got so caught up in this! I need to keep reading!!! !